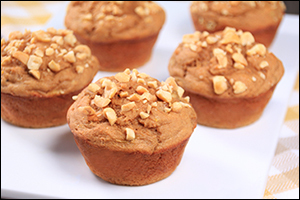 This muffin recipe is a serious game changer -- insanely delicious and crammed with protein! In a large bowl, combine both types of flour, powdered peanut butter, protein powder, sugar, baking soda, cinnamon, baking powder, and salt. Mix well. Stir mashed banana and 2 tbsp. peanuts into the batter. Evenly distribute batter among the cups of the muffin pan, and smooth out the surfaces. (Cups will be full.) Evenly sprinkle cups with remaining 2 tbsp. peanuts. HG Tips: Store leftover muffins in the fridge so they last longer. Or freeze 'em! To freeze, tightly wrap each cooled muffin in plastic wrap. Place individually wrapped muffins in a sealable container, seal, and place in the freezer. To thaw, unwrap and place on a microwave-safe plate. Microwave at 50 percent power for 1 minute. Continue to microwave at 50 percent power in 10-second increments, until muffin reaches your desired temperature. Only five ingredients needed for this super-fun snack platter... Grab a buddy, and CHOMP! Core apple(s), and cut into half-moon slices about 1/4-inch thick. Lay slices on a large plate, and sprinkle with cinnamon. In a small bowl, combine powdered peanut butter with 3 tbsp. water. Mix until smooth and uniform. 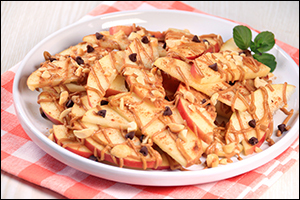 Drizzle PB mixture over the apple slices, and top with chocolate chips and peanuts. You've gotta pass this along... if you appreciate your friends, that is! Click "Send to a Friend" STAT.